This gets a lot of use in my kitchen. In one motion, it cuts 8 perfect apple slices. I use it for cutting both plain and caramel apples. 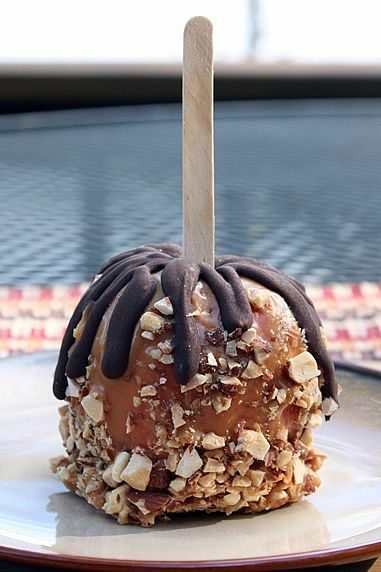 Caramel apples are a favorite fall treat. They're festive, delicious, and fun to make. 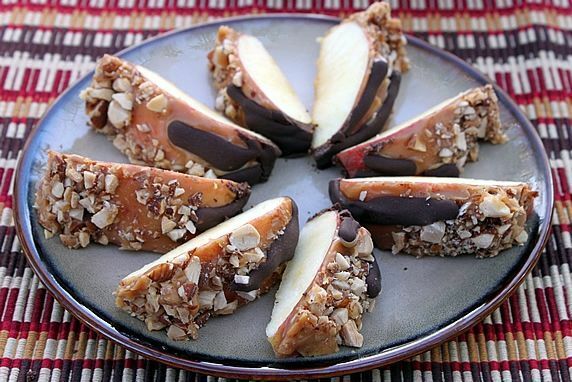 (Check out my post about Making Easy Caramel Apples With A Gourmet Flair.) The only trouble is, they can be challenging to eat. The most common way--holding the stick in your hand and chomping into the gooey, sticky apple--can get to be pretty messy and awkward. Not sure if there's proper etiquette for eating one of these stick-to-your-teeth treats. Let's just say, normally, it ain't pretty. Another problem is that once you've chomped into your apple, there's not an easy or sanitary way to share it with someone else. It can be hard to eat an entire caramel apple by yourself, so that often means that some of it goes to waste. 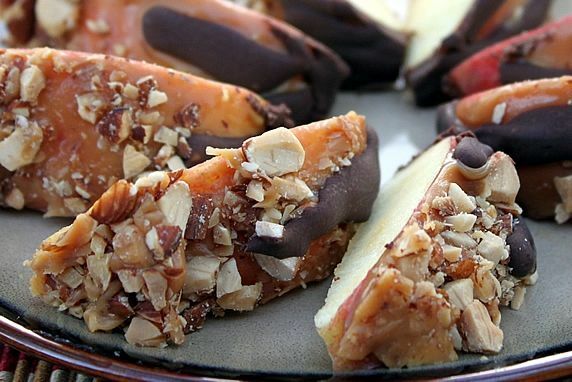 There is a simple solution: cut your caramel apple into pieces. That way you can eat it without getting it all over your face, and it can be shared with others. (You can ignore the sharing part, if you'd rather keep it all to yourself.) Although you can cut the apple with a knife, that can be tricky. You're likely to end up with an assortment of odd sized pieces and sticky caramel all over both of your hands. It's also hard to keep the nuts or other goodies intact while you cut. 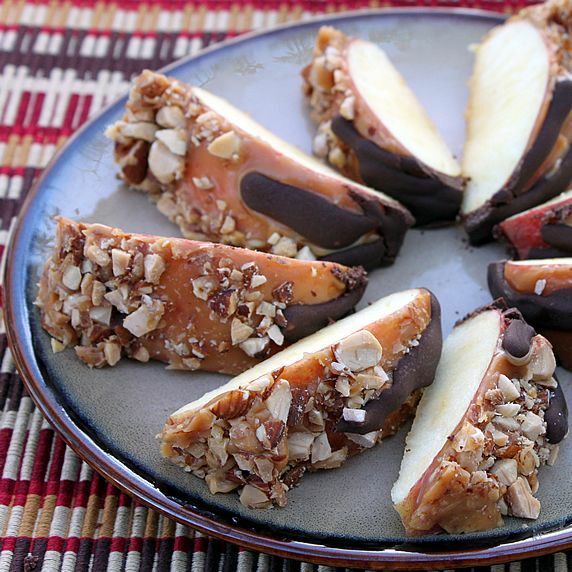 Here's the easy, tidy, attractive way to cut a caramel apple. It involves a gadget. I love gadgets. This one is a must-have. Step 1: Put your apple on a plate or cutting board. Step 2. Slice the apple. Here's a top view showing how easy it is to cut a caramel apple. Center the apple slicer on top of the apple, putting the stick through the center hole in the slicer. Push down with even pressure. 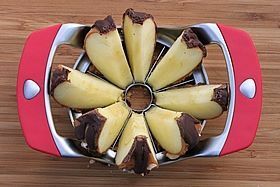 As you push, the apple slicer cuts out the core and cuts the apple into neat, even slices--all in one stroke! 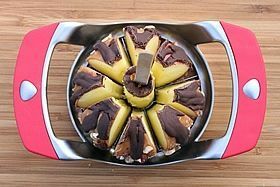 UPDATE: Read my post, Caramel Apples--More Tips, for additional advice about cutting your apples. Step 3. Serve and eat. It's easier to eat--completely eliminating the messy factor. 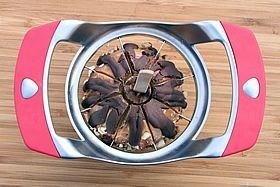 It's easier to share--much better than everyone chomping off of the same apple, completely eliminating the germ factor. It's easier to serve--you can cut up one caramel apple or a variety of caramel apple flavors, arrange them on a plate, and have a beautiful serving platter of sure-to-please finger food. Note: the sliced apples will eventually start to brown, so don't cut them too far in advance. 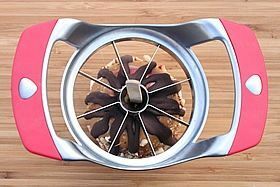 The apple slicer is so fast to use, that it's easy to cut these up for a serving platter at the last minute. Quick Party Tip: I highly recommend making your own caramel apples, because they're fun and taste so good. But if you need a quick, festive finger food platter for a party and you don't have time to cook, buy some ready-made caramel apples at the store, slice and serve them up. It'll be hard to find a party guest who won't love these. But, if you make your own, they can look like these and taste even better. 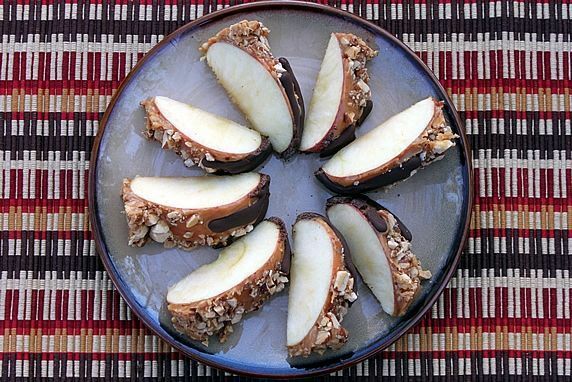 Either way, sliced caramel apples will make it a yummy day!